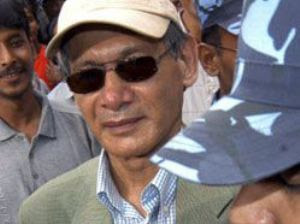 KATHMANDU: He may be behinds bars since 2003 but Charles Sobhraj, the dishy villain of the 1970s who was wanted for crimes in over a dozen countries, has apparently not been forgotten by the outside world. The Frenchman's nearly four-decade-old saga in Nepal, that includes murder, possible espionage and drug deals, and an incredible love story behind bars, has now received a new twist with a "blonde bombshell" walking inside prison and avowing she would get him released. The new woman in the 67-year-old's life described herself as a British lawyer from London, Elizabeth Stubbs. In her 40s, the blonde provided high drama in Kathmandu's Central Jail on Friday, persuading the jailer to let her meet Sobhraj though visits are not allowed on Fridays. To add icing to that, she was also allowed to meet "The Serpent", as Sobhraj was dubbed by the tabloid media, outside the normal visiting area, where a wire mesh separates the detainees from the visitors. She then hugged and kissed the astonished Sobhraj, saying she had set up an organisation in London - Sobhraj Services - that purportedly provides free legal information and services. The woman then told Sobhraj - who is serving a 20-year term for the murder of an American tourist in 1975 - that she would leave no stones unturned to get him released. Quick to recover his balance, the suave Sobhraj told her that his mother-in-law, who was also his lawyer, was handling his review petition in Supreme Court on his behalf and was capable of doing everything that needed to be done. However, if she wanted to help, he said she could always contact the Human Rights Committee in Geneva, to whom he has complained of wrongful imprisonment by the Nepali authorities. The mystery about Stubbs, whose web site www.sobhrajservices.com is as enigmatic as she herself is, thickened with the visitor reportedly singing a different tune that same evening when she had a meeting in her hotel with Sobhraj's Nepali fiancee Nihita Biswas and her mother, Shakuntala Thapa. She reportedly advised Nihita, who says she married Sobhraj inside prison and has been campaigning in the media and elsewhere for his release, to forget him and start life afresh. She also reportedly offered to sponsor Nihita's education in the UK for two years. When the young woman refused, the blonde reportedly said she could make life difficult for the mother-daughter duo. Stubbs is the second mysterious visitor Sobhraj received this year. The other was an Indian contract killer, whose identity is still not confirmed. The Indian tried to kill an influential Nepali, billeted in the same prison as Sobhraj for running a fake Indian currency trade, and has now been sentenced to prison for five years. Sobhraj fears his enemies, worried that he could be released soon, are on his trail. He suspects they sent the woman to reconnoitre and the mission would be followed by an attempt on his life.